Asakusa is one of the most popular tourist destinations in Tokyo. It’s unique because a walk through the neighborhood is both entertaining and educational. 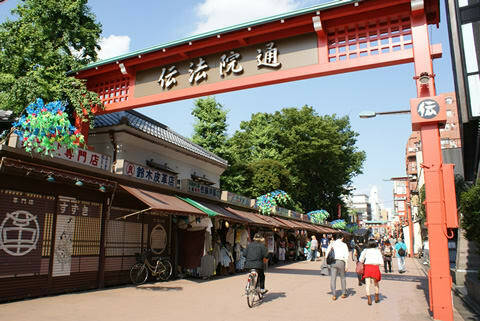 For example, wander down Asakusa Nakamise Shotengai, which connects Kaminarimon and Sensoji, and you’ll slip back in time to an older Japan. In this article, we’ve listed a few spots where you can relish the history and culture of Japan. The Amuse Museum aspires to bridge the past, present and future of Japan. 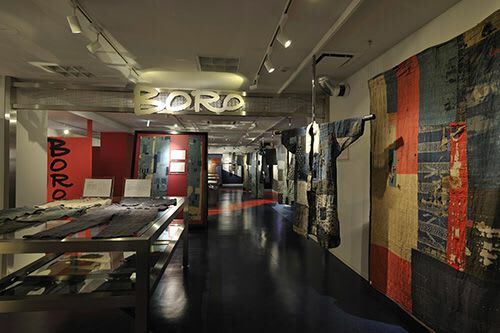 Starting with the past, the museum exhibits the spirit of an older Japan through its displays of old Japanese textiles and crafts. The museum also houses memorabilia from Akira Kurosawa’s “Yume” and ukiyo-e inspired art pieces. These varied exhibits allow visitors to discover Japanese culture from different angles. In addition to exhibits of Japanese crafts, the Amuse Museum contains a mini-theater, showing visual works on ukiyo-e, and a live performance space for staging special exhibits and performances of Japanese music and dance. Finally, a bar inside the museum opens when the museum closes. Edo kiriko is a traditional glass-etching technique. According to lore – Kyubei Kagaya – who owned a glass business in Edo Odenmacho during the late-Edo period, is the originator of edo kiriko. Legend says that even Commodore Perry was amazed by the artistry and craftsmanship of Kagaya’s edo kiriko. Kiriko patterns can be assembled in infinite combinations and they run the gamut from traditional patterns to contemporary designs. 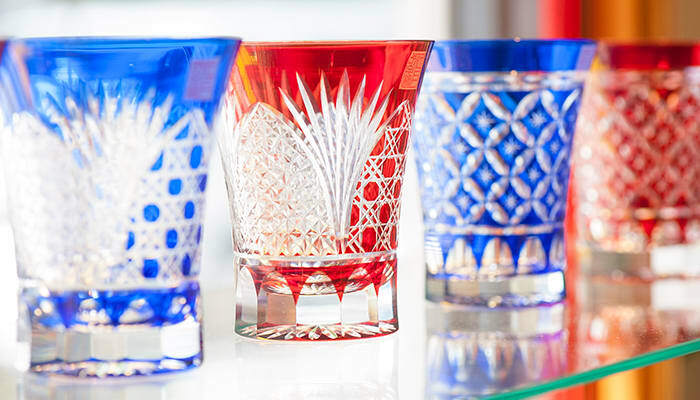 Sumida Edo Kiriko-Kan sells over 350 pieces of edo kiriko, crafted by Hirota Glass, a workshop with over 100 years of history and experience. The museum also houses a studio where you can not only view exhibits tracing the evolution of glass and rare edo kiriko pieces, but you can also try your hand at edo kiriko. Etch a kiriko pattern and experience a traditional Japanese craft. Closed Sundays, holidays and select days during summer, year-end and new year’s. Asakusa is not just a place to visit temples and shrines – you can also experience a retro side of Tokyo here. For those of you who want to explore an “underground” side of Tokyo, we recommend walking through Asakusa Underground Shopping Street. You can access the shopping street by exiting Asakusa Station from the Tokyo Metro Ginza Line and walking towards Tobu Line / Matsuya Department Store. Asakusa Chika Shotengai is one of the oldest underground shopping streets in Tokyo and also one of the few remaining places where you can still experience “Showa-era retro”. 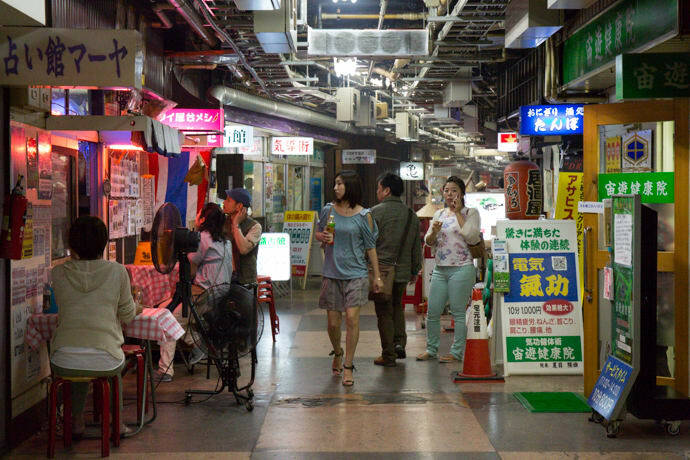 The haphazard ambiance is reminiscent of the Showa-era and the shopping street almost feels like a movie set. A motley mix of fortune telling booths, 700 yen barbers and Thai / Vietnamese food stalls line the underground street. Also, prices are rock bottom, even compared to suburban areas. Places like Sensoji and Kaminarimon are classic destinations and certainly must-visit spots in their own right. However, at a place like Asakusa Chika Shotengai, you’ll experience a more raw and vivid side of Tokyo’s history. If you’re visiting Asakusa, stop by Asakusa Chika Shotengai and you may see an unexpected side of Tokyo. Store hours vary by store. Located immediately outside of Asakusa Station Exit 6 on Tokyo Metro Ginza Line. Free admission and reservations are not required. Atelier Sogeikan, which has been accredited by Sumida-ku Traditional Arts Preservation Society and Sumida-ku Sumida Workshop, is a studio where you can learn “edo moji”. Edo moji is the distinctive lettering style typically used on signs for kabuki and rakugo. The craftsmen who paint edo moji, as well as family crests, on signs, lanterns and flyers are known as “kaki-ya”. Various craftsmen, including kaki-ya, ply their trade in Sumida. Why not take this opportunity to explore the world of kanji? There’s a workshop at Atelier Sogeikan, where you can make lanterns and fans with edo moji or observe the techniques of veteran kaki-ya. 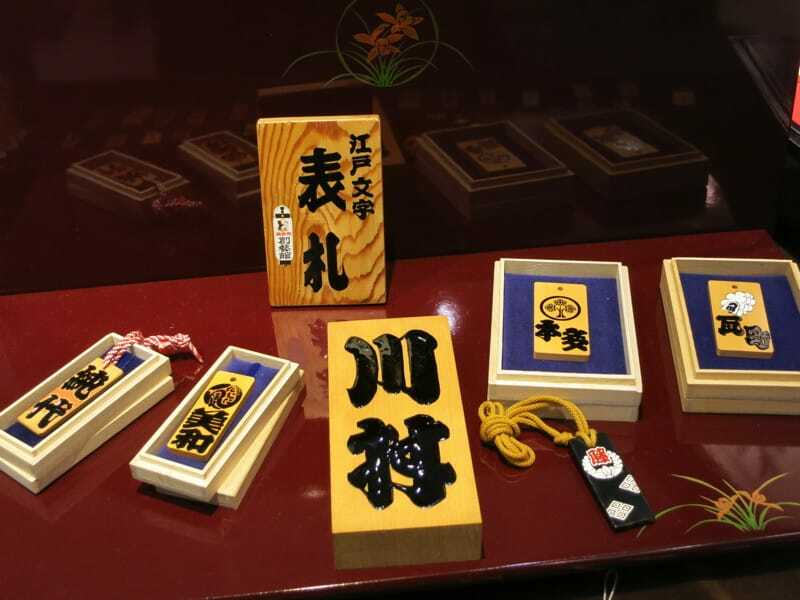 Atelier Sogeikan also sells various souvenirs, such as netsuke (a cord clip) illustrated with a motif of Tokyo Skytree painted in lacquer (1,100 yen). Try your hand at edo moji, in addition to exploring Asakusa. It’s a unique and very much “Edo” experience. No scheduled holidays or closures. Note that the studio may be closed on regular days if there are ongoing exhibits or workshops. 10 minute walk from Kinshicho Station North Exit on JR Sobu and Tokyo Metro Hanzomon Lines. 8 minute walk from Oshiage Station Exit B2 on Tokyo Metro Hanzomon, Keisei and Toei Asakusa Lines. Classes should be reserved in advance. Asakusa Omatsuri Museum aspires to educate and protect the customs of omatsuri (traditional festivals) in Tokyo. 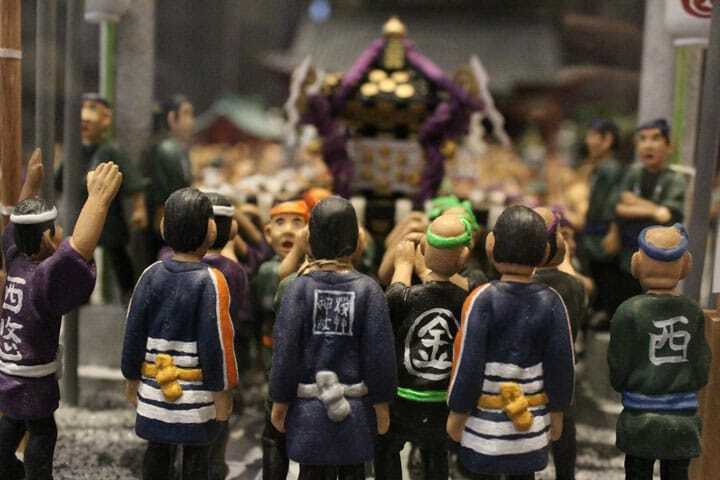 See miniature omatsuri replicas and various omatsuri paraphernalia like outfits and instruments. For example, the museum displays “hyoshigi” or wood-block clappers – a staple in omatsuri music. In addition to outfits and instruments, the museum also displays a large selection of sake, which is another key component of omatsuri. Learning about Japanese culture through the lens of omatsuri should be an educational and fun experience. Since Asakusa Omatsuri Museum is owned by Tokyo Wazarashi, a textile designer and maker, the museum has an adjoining shop where you can purchase beautifully dyed tenugui (hand towels) that make for perfect souvenirs. They periodically host dying workshops, so this museum may also interest dye aficionados. Brushing up on omatsuri knowledge at Asakusa Omatsuri Museum before attending one in person, may make your next omatsuri experience that much more enjoyable! Note that opening time may change on certain days. 2 minute walk from Asakusa Station Exit A4 on Tokyo Metro, Tobu and Toei Lines. Denboin-dori, commonly known as “Denyoko”, is a street that runs parallel to Denboin and stretches between the nakamise of Asakusa and Orange Street. Denboin-dori is lined with small shops selling artisanal crafts, such as edo kiriko, and street foods. Marvel at the entrance gate of Denboin-dori, which has been refurbished with onigawara tiles from Sensoji’s original Hozo-mon, and relish the ambient lanterns that line the street. The eponymous Denboin, where the chief priest of Sensoji resides, is also located along Denboin-dori. The guest house and entrance hall at Denboin were constructed during the late-18th century and the guest house is used to host sutra transcription sessions. Unfortunately, Denboin is not open to the public. Also keep your eye out for fire watchtowers. Since fires were extremely common during Edo-era (Sensoji itself has burned down multiple times), watchtowers were built across Edo to quickly spot budding fires. Due to this history, watchtowers became symbolic of urban development in Edo. Simply wander around and you can discover a surprising amount about the charms and characteristics of Edo. Business days and hours vary by store. 2 minute walk from Asakusa Station on Ginza and Toei Lines. 2 minute walk from Asakusa station on Tsukuba Express. Free admission and reservation are not required. Landscaper, Rokusaburo Morita, established Hanayashiki in 1853 as a flower garden. During the Meiji period, they added exotic animals, birds and various circus acts, which quickly garnered popularity. 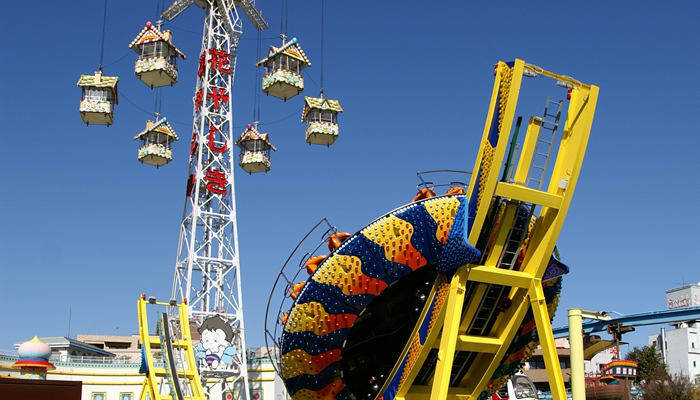 Subsequently, Hanayashiki would build Japan’s oldest rollercoaster in 1953, after repeated interruptions from earthquakes and wars, and the “Satellite / Bee Tower” (an aerial merry-go-round like ride) in 1960. Both rides became landmarks of Asakusa (sadly, the Bee Tower was closed in 2016). Currently, Hanayashiki organizes attractions under various themes, such as “Fantasy”, “Speed and Thrill”, and “Mysterious and Panic”. In total, there are 19 attractions, including dizzying rides like “Carnival” and “Disko” and standard attractions like the ghost house and merry-go-round. Additionally, there is a carnival game area with attractions like shooting galleries and food booths are dispersed around the park. Visiting Hanayashiki should provide an interesting contrast to newer spots like Tokyo Skytree and you may discover a side of Asakusa you haven’t yet seen. Park Hours: 10:00 – 18:00 Last entry is 30 minutes before closing time. Note that park hours vary based on season and weather. No planned closures. However, it may be closed for maintenance on certain days. 5 minute walk from Asakusa Station on Ginza, Asakusa and Tobu Skytree Lines. There are no time limits for the park.